Email Signatures are important. So are ticket signatures. They act like a business card and make us look the part. 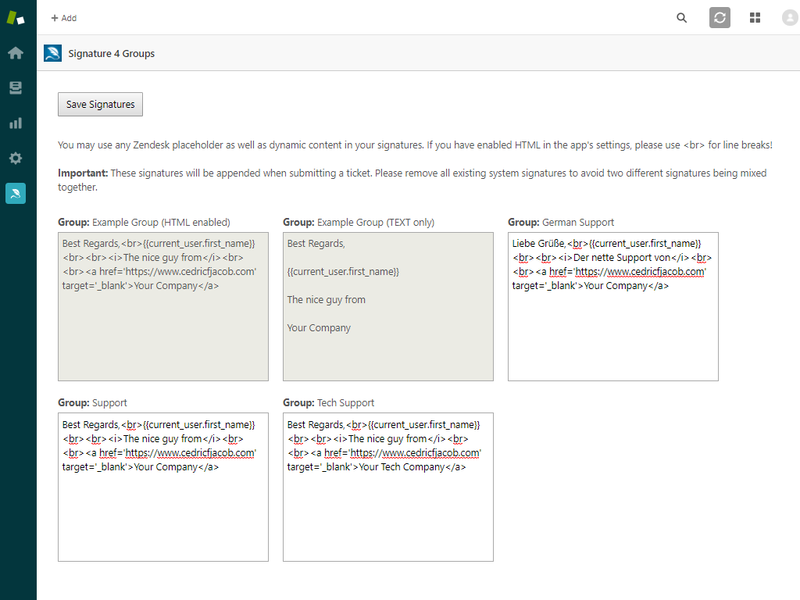 When it comes to signatures in Zendesk, our options are a little limited. That is where Signature 4 Groups comes into play. The app allows you to set individual signatures for every group while enabling you to use HTML, dynamic content and any Zendesk placeholders for more dynamic content and styling options as well. In this case you would like your signature to change the language according to the customer's lanuage settings. Further more, you would like your payment specialst to change his signature when replying to a technical related question. 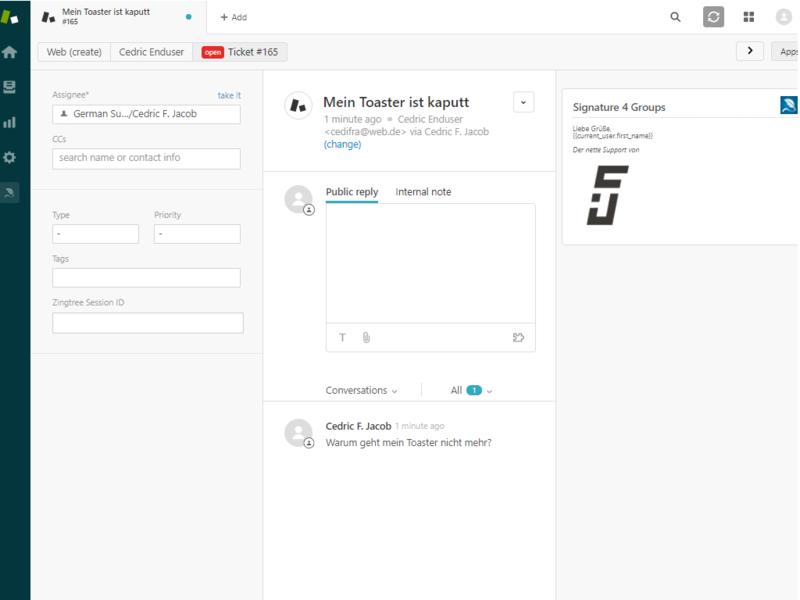 With Signature 4 Groups you can use dynamic content, that displays the text in the right language. You can also choose a different text for each group. In this example, we will also use HTML to make the signature more professional looking. But not to worry, the setup takes less than 2 minutes and you will be up and running in no time. So let's go! Tick this box if you would like to use HTML in your signatures. Tick the box if you would like your agents to see a preview of their signature in each ticket. And that is it! Save the settings and give it a try. 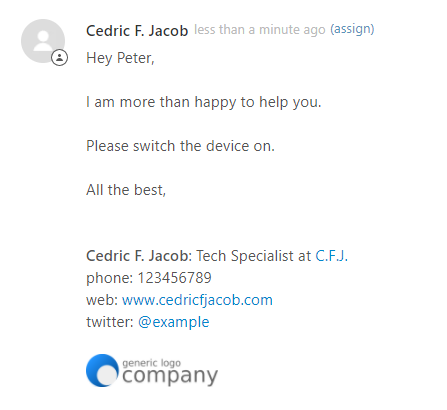 Signatures can be set using the nav-bar app. Please note: Only admins can set the signatures. 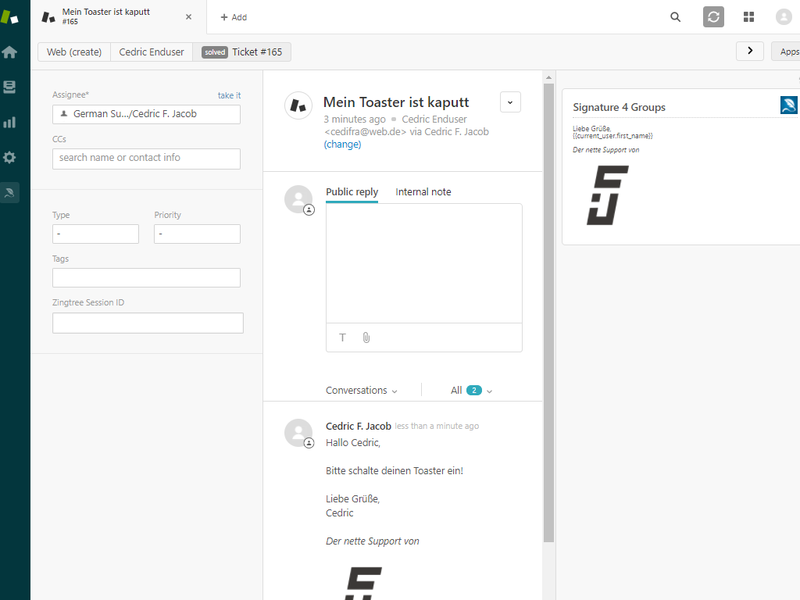 When opening a ticket, a group has to be selected in order for the app to pick the right signature and to release the Submit button. When submitting the ticket, the right signature is set automatically. Not only is the app finally available in Zendesk's very own Marketplace, you can use the code below to test the app for free. Visit Zendesk's Marketplace and try the app for free. I am always happy to receive suggestions. So if you know about a cool game I might enjoy or you got a question about Zendesk, whatever it is, please let me know! I might end up writing about it.